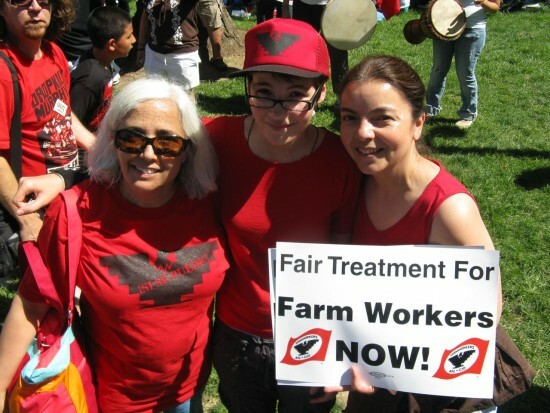 UFW Stories: "Three Generations of Farm Worker Supporters"
"Three Generations of Farm Worker Supporters"
My father’s entire life has been devoted to Labor and the fight for workers’ rights. Even well into his 70’s he is still fighting the good fight. His passion for the right to all workers to unionize led to him march with the Farm Workers on their long march from Delano in 1966. He has been a staunch supporter of the United Farm Workers ever since. Dad helped us understand what was at stake for the Farm Workers, the basic rights they were fighting for, and we kids became strong supporters in the Boycott Grapes campaign. We wore Boycott Grapes buttons, made pictures of Farm Workers in the fields out of yarn and macaroni to share at school, sewed Viva La Causa patches on our clothes, and had Boycott Grapes bumper stickers on our cars. La Causa became a part of who we are, and our care and concern for Farm Workers’ rights has never faded. I have marched many times for Farm Workers as an adult. Now as a mother, I am happy to share my experiences with my children, and I am so proud that my kids continue to spread the word about La Causa as they write school papers and talk to their friends. We have all marched together with the United Farm Workers as the struggle for fair treatment continues, most recently this summer in Sacramento to demand greater protections from Governor Brown, which he did sign into law. Viva La Causa!